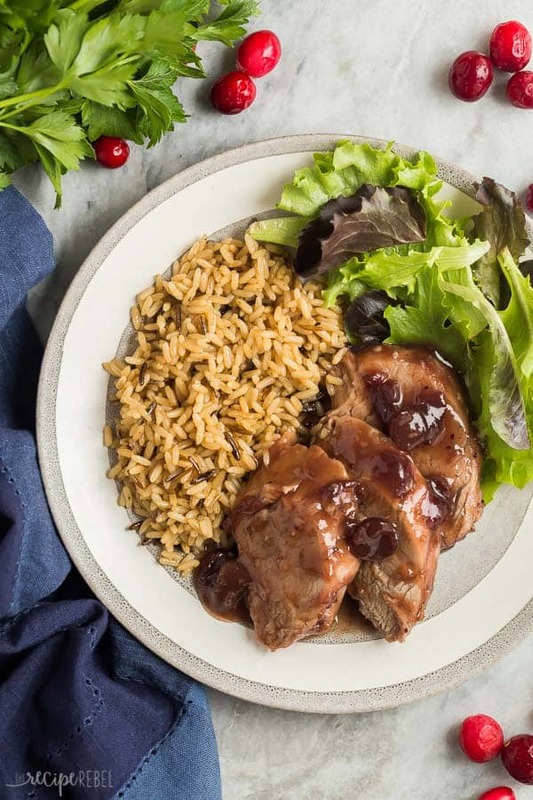 This Crock Pot Pork Tenderloin with Cranberry Sauce is an easy weeknight meal or a fancy holiday dinner — you decide! The BEST pork tenderloin recipe. So I was digging through my freezer last week and discovered I had two packages of pork tenderloins down in the bottom. I was thrilled! Pork tenderloin is one of those things that cooks so quickly and easily that it can easily be supper on a crazy weeknight when you have a million other things going on, or it can be dressed up as Thanksgiving or Christmas dinner. I long ago discovered the amazing combination that is pork and cranberry but I’ve yet to do anything with it around here. Today’s the day that changes! Since you’re all going to have buckets of leftover cranberry sauce from Thanksgiving and Christmas, it’s probably a good idea to add this to your post-holiday-leftovers menu. 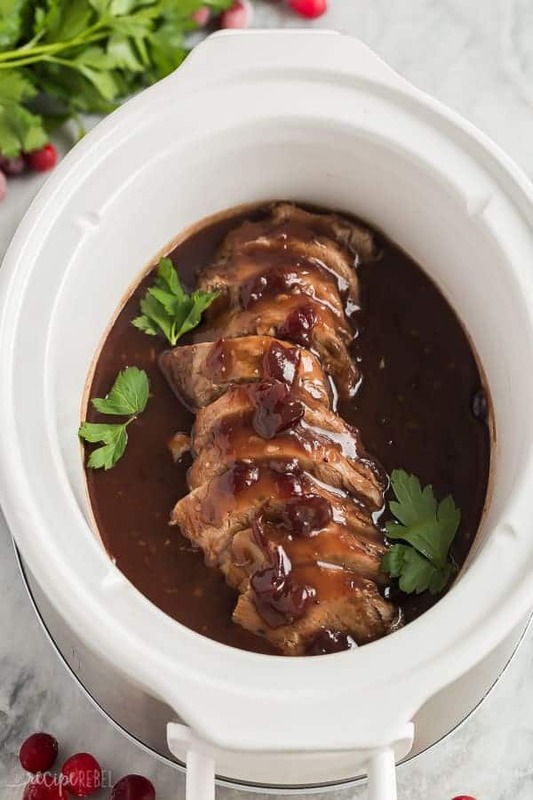 This cranberry sauce is awesome over mashed potatoes with a side of veggies or salad — it’s the perfect combination of sweet and tangy and savory — and the crock pot pork tenderloin is so tenderloin, you can cut it with a fork! What’s the difference between a pork loin and pork tenderloin? 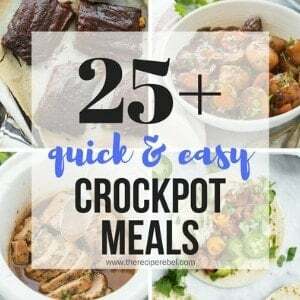 You can definitely use this recipe for pork loin (I love cooking pork loin in my crock pot or slow cooker, too! ), but you’ll need to adjust the cook time because they are not the same thing. A pork tenderloin is always right around the 1 lb (between .75lbs and 2 lbs) mark in weight, while a pork loin can fall anywhere between 2 and 5 lbs. Trim the silver skin. Once you unwrap your pork tenderloin, you’ll see a silver skin that runs almost the length of the tenderloin. You want to take a sharp knife and run it along the edge to remove this skin, which can become tough and chewy during the cooking process. Here is a handy little video that shows you how if you’re unsure. Prep the sauce. The sauce is simple and you can definitely adjust the seasonings to your tastes. Feel free to substitute homemade cranberry sauce for my shortcut of canned whole berry cranberry sauce if you have it around. Lay the tenderloin flat. You will likely want to cut the pork tenderloin in half to fit flat in the slow cooker, so that it cooks evenly. Don’t overcook. Tenderloin doesn’t actually take that long to cook, so be sure not to leave it cooking all day or it will end up dry. A thermometer in the thickest part of the tenderloin should read 150-160 degrees, depending on how well you like it done. This Crock Pot Pork Tenderloin is a great recipe to prep ahead for the the next day! You can simply prepare the sauce and tenderloin in the crock pot, cover, and refrigerate until the morning. In the morning (or afternoon! ), place the pot in the slow cooker and continue with the cooking process. 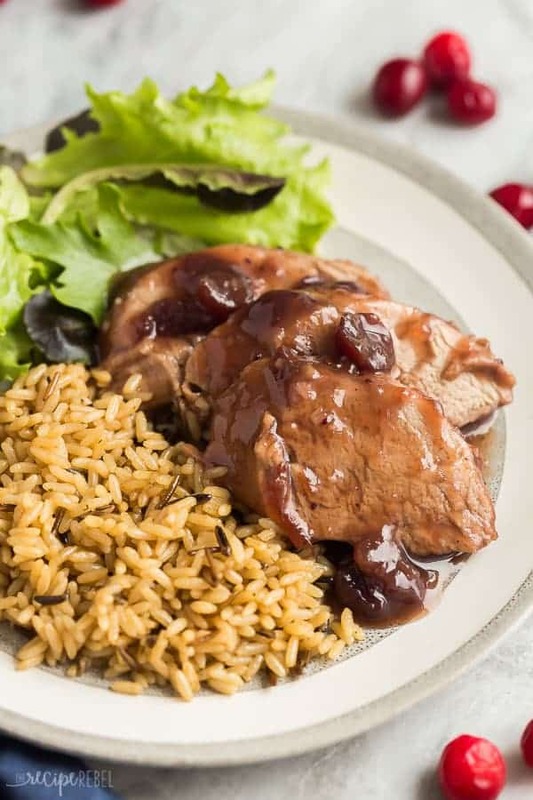 This Crock Pot Pork Tenderloin with Cranberry Sauce is an easy slow cooker meal or a fancy holiday dinner -- you decide! The BEST pork tenderloin recipe. Place pork tenderloin in 2-4 quart crock pot, cutting in half lengthwise to fit flat if necessary. In a large bowl or glass measuring cup, whisk together cranberry sauce, sugar, broth, vinegar, corn starch, garlic, salt and pepper. Pour over tenderloin in crock pot, lifting the pork to let the sauce seep underneath. Cover and cook on high for 2 hours or low for 4 hours, or until it reaches an internal temperature of 150-165 degrees. Remove pork and place on a cutting board to rest for 3-5 minutes. If desired, add an additional tablespoon of corn starch mixed with a tablespoon of water to thicken remaining juices. OPTIONAL: You can sear the tenderloin before slow cooking, but I choose not too. The exterior won't be crispy when you serve as it is cooked in a moist environment. I over cooked my pork loin …. I did not have tenderloin, but I cooked it for 2 hrs on high and checked the temp and it was 180. But I cut it up and put it back in the sauce and it’s tolerable, but I can’t wait to make again the flavor is amazing and if it wasn’t dry it would have been amazing but that’s on me!! Two hours on high is definitely not too much for a pork loin! I cook pork loin in the slow cooker for 8-10 hours as they are usually pretty large. I’m guessing that you did have a tenderloin? It is often easier to tell by the weight. Most pork loins are quite large and require a long cook time. If I use a pork loin instead of a tenderloin, should I still cut it in half? You will likely have to cut it to fit, but a pork loin is quite a bit larger so you will need to add a significant amount of cook time. I need to double the recipe. 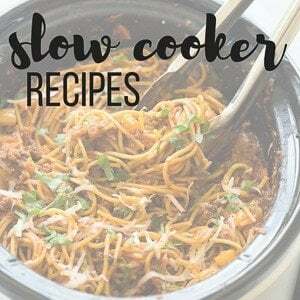 Can I do that in a 6qt slow cooker? Yes, you should be able to fit them in just fine! I hope you enjoy it! I made some sauce to go with my pre-cooked pork loin last night. I combined all ingredients and cooked it down in a little frying pan, omitted corn starch. I’m pretty picky… but this was FANTASTIC! 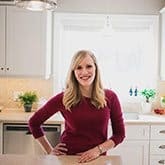 My husband had to know how I made it. 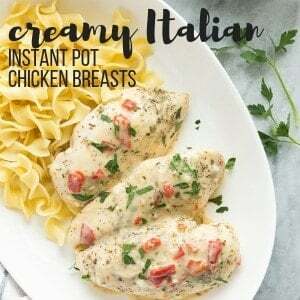 I highly suggest this simple yet delicious recipe. I’m so happy to hear that! We love this sauce over pork too! Made this last night and OH MY GOD!! It was amazing. Thank you for posting this! This was awesome!! Served it for our Thanksgiving dinner (we served 120 members of our community turkey dinner last Sat.) as we were over turkey. Served with mashed potatoes, collards, corn and apple sauce. Thickened the sauce to serve over everything. No leftovers. Absolutely one of the best pork recipes I have ever made. Thanks!! That just makes my day Sue! I’m so happy that that everyone enjoyed it! Definitely! You’d want to cook the tenderloin first with some clear liquid, then remove and add the cranberry sauce, corn starch and other sauce ingredients just at the end on saute.